Wanna play tourist with me? Shall we go explore a beautiful part of my country that I have never visited before? Wanna go see the windmills spin in the wind? And I mean really see them spin? Okay then here we go. This is part three of our little mini vacation I took with my Love at the beginning of Oktober. On day 1 we went hunting for design and decorating inspiration, on day 2 we visited Amsterdam and on day 3 we went to explore what might be the most touristy bit in our country outside of Amsterdam: the Zaanse Schans. The Zaanse Schans is a piece of the Netherlands that is about as Dutch as it can get. 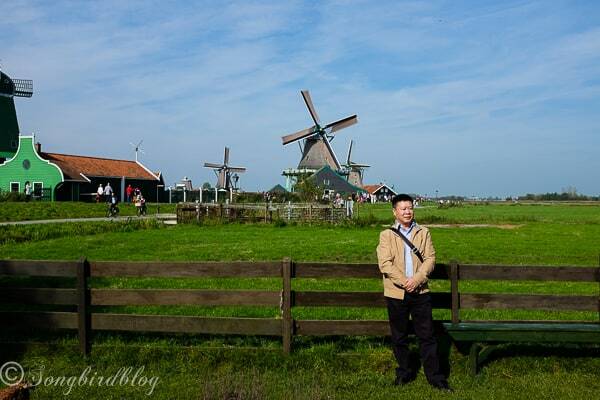 It is a flat landscape with lots of water, quaint little wooden houses and lots and lots of windmills. You might say it is a bit of an industrial area from days long gone by that has been preserved. Those mills used to work hard for the woodworkers who were building ships close by, grind ingredients for paint colors that Rembrandt himself used and generally provided the power for lots of things that people needed power for. But before we go wander around the little town that is still there. Can I show you the hotel we were staying in…. Yep, a modern hotel completely in the style of the historic region it is situated in. In fact a large part of the ‘modern’ part of Zaandam (the town close to Amsterdam where we stayed overnight) is built as a tribute to its roots. But enough of that. As nice of a town Zaandam is, that is not what we came here for. The Zaanse Schans was on my bucket list for as long as I can remember. I always knew about it, I never visited it. Being that it is quite far away there always seemed to be more pressing destinations to go visit first. But it is one of the most well known bits of our country. It attracts close to a million visitors each year and most foreign tourists will take a bus trip from Amsterdam to visit it. So many Japanese, American or Russian visitors had seen something in my very own country that I had never visited. Time to rectify that situation. Zaanse Schans is a neighbourhood and a kind of open air museum at the same time. The windmills have been here since they were built. The houses are original houses from the region that have been moved here (probably to replace more modern buildings that had replaced the originals) to preserve them. People actually live here, so it is a real neighborhood, they just have to share their village with a lot of guests. One of the buildings now houses ‘the first’ Albert Heyn grocery store. Albert Heyn (AH) is the first drug store in the Netherlands that grew into a chain of stores. It is the market leader here and has grown into a global conglomerate. But it all started here, with one man named Albert who had a little store in a beautiful green house. This is not the actual first store, but it must have looked a lot like it. Inside, this vintage loving gal, had the time of her life. Couldn’t help myself, these images needed a vintage filter…..
That little house is and looks exactly as the kind of grocery store our great-grandmothers would go too. All the products, the containers, the packaging, the shop displays, everything was original and old. And I couldn’t help wonder if I would like to do my grocery shopping more if shops still looked like this, and sugar was still measured especially for you and wrapped in a little brown bag. Enough nostalgia, let’s go walk outside some more. It was a beautiful day. We were definitely not alone, but as it was so late in the season, we didn’t have to wade through crowds to see anything. I could have easily taken a picture without someone posing in front of the mill. In fact I did. But I liked the image so much better with this Japanese fellow in it. I didn’t ask his permission to be posted here on my blog, so please don’t tell him. Green and blue are the colors of the town. The green of the trees and grasses and the blue of the sky and water. And it is all reflected in the houses. Doesn’t this just look like a dream? This house used to belong to a merchant, I think his business must have been quite successful: his front door is rather posh. I told you they were spinning in the wind! That three day mini vacation at the beginning of the month was so wonderful. A little break from the daily grind, some time up close and personal with the one I love most in this world, being outside and enjoying the gift of a beautiful Fall, seeing sights and being inspired and generally having a great time. I soaked it all in as if there was no tomorrow for you never know if there will be. Thank you for coming along and letting me share. I hope you enjoyed our mini vacation too. I am off now, I have have some major sanding and hopefully painting on the schedule for today. Oh my! I LOVE this! I collect windmill paintings (I am a little obsessed with windmills) and I need to visit this place. I am going to pester my husband until he takes me!! Good luck with pestering your husband. If you are going to visit Zaanse Schans, you must check out Kinderdijk too. More windmills for you to admire. Chances are I will never get to see a real windmill such as these. Thank you for taking me along on your mini vacation! These scenery is beautiful, so it’s no wonder that tourists flock there. Where will you take me next? I have something up my sleeve…. I promise you there will be sun shine. Loved your mini vacation. I have a lot of Dutch heritage so this was a real treat to read about!! I loved this tour! So different from what we have here. But no wooden shoes?! No, no wooden shoes. There was cheese though! A little cheese factory with lots of Dutch cheese and a cheese girl in full out costume. She might have been wearing wooden shoes, can’t remember. Thank you so much for this post! My husband’s job sent us to Europe for 4 1/2 months over 20 years ago, and the only photo I enlarged and framed was my four young children posed in front of Zaanse Schans. We loved it, and even brought my husband (who’d been working in Switzerland the first time we were there) back to see it. We bought gouda there–and oliebollen from a little stand in front of the train station in Amsterdam. Wonderful memories of a beautiful country with some lovely people. I’m glad you finally got to see it! Oh, how wonderful. I am so glad you liked the post. December is the time we eat oliebollen here, especially around new years eve. But you can get them year round, as you found out. I enjoyed this post very much! My hubby and I just got back from a very spontaneous trip to Amsterdam and I wish I would have known about this place yesterday, especially the hotel you stayed in, it looks amazing from the outside! Since our trip was so spontaneous, I didn’t do a lot of research about the sights in and around Amsterdam, so we just walked around town a lot, dodging the cyclists, ha ha! Sweet hugs to you too. I am glad you liked this post, it was fun to make.